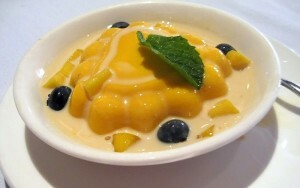 Mango Pudding: Mango pudding is a Hong Kong dessert usually served cold. The fresh variant consists of agar or gelatine, mangoes, evaporated milk, and sugar. In addition, fresh fruit such as mango, strawberries, berries and kiwifruit, are occasionally added as garnish. Served and eaten refrigerator cold, mango pudding has a rich and creamy texture. Peel the skin off the ripe mango. Cut the mango into cubes, and puree to make 1 cup mango puree. In a medium sized bowl, assemble all the ingredients. Beat the ingredients with a whisk or an electric blender until smooth and there are no lumps. In a saucepan, bring this entire mixture to a boil on a medium low flame, stirring continuously. Boil the mixture for about 8 to 10 minutes, or till the mixture starts to thicken. Pour the boiled mixture into individual bowls. Cool them down to room temperature. Cool the set mango pudding in the refrigerator for 2-3 hours. Before serving, unmold the mango pudding into a serving bowl. Garnish with fresh blue berries and mint leaf. Mango pudding is ready to be served. If you have any queries regarding the Mango Pudding recipe, please leave a comment.